From September 2018 the group will only meet for one hour 10.30 to 11.30. We will still enjoy a wide variety of music and dances from Europe and beyond, mixing our favourite dances with some new ones. The programme for 2018/19 will include dances from Israel, Russia, Romania and Bulgaria, many of which are non partner dances in circle formation. We are an informal group so please come and try us out. Tuesday mornings (2nd & 4th) of every month are most enjoyable. The dancing is mostly in circles (or semi circles) but there are some partner dances which add to the mix. The music is varied. There have been some new dances added to or repertoire from Macedonia, Bosnia and we have re-learnt dances from Croatia, Bolivia and other countries. 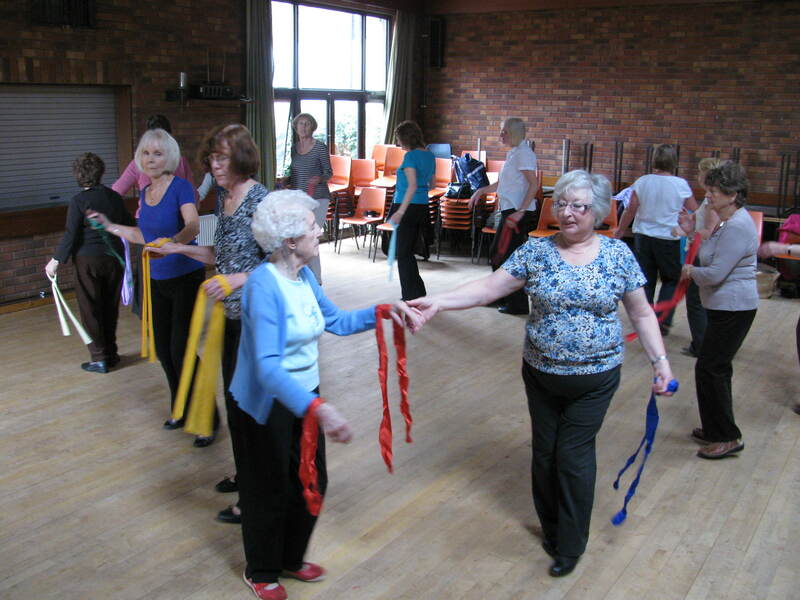 To me the dancing not only helps loosen muscles but keeps the brain alive – thinking remembering etc. It is a cheerful way to start the day . Come and join us. We still meet 10.00 to 12.00 Foster Ave R.C. church hall, which is a very handy place. Following our Easter break we started in earnest with a collection of new dances. We tackled a couple of South American dances – one from Mexico and one with Venezuela. Both had new steps to have a go at, the trickiest being the zapateado step which caused some merriment. We also had a go at some “drifty” dances from Bosnia, Macedonia and Hungary. We look forward to having another go in the future along with some of our old favourites. We still meet at the R.C. Church Hall off Foster Avenue and would welcome new members. At our last meeting, we tried something else new – square sets. The dance from Sardinia had some interesting formations and patterns which the group successfully conquered albeit with lots of laughter – always a good thing. Each meeting we remember old dances and learn new ones so if there are new members we all start on nearly the same foot. 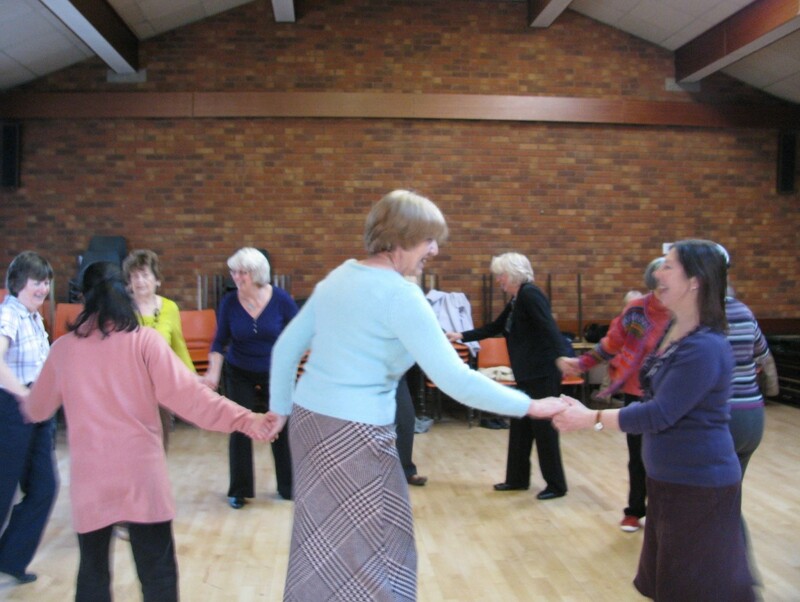 We do welcome new members who wish to laugh and dance (dance walk) with us. Next meetings are 14th and 28th March. 25th April, May 9th and 23rd 10am-12 Church Hall Foster Avenue behind RC Church. Regular meetings have continued at the R.C. church hall off Foster avenue. We have grown in confidence and ability. Last Tuesday (Nov 8th) dawned cold and frosty. We turned up at our hall to find no heating, brrrrr! We danced in coats, and gloves without a break – no time for teaching this week, no long walk throughs and we all had a good fun time. Some of us even managed to remove an outer layer! 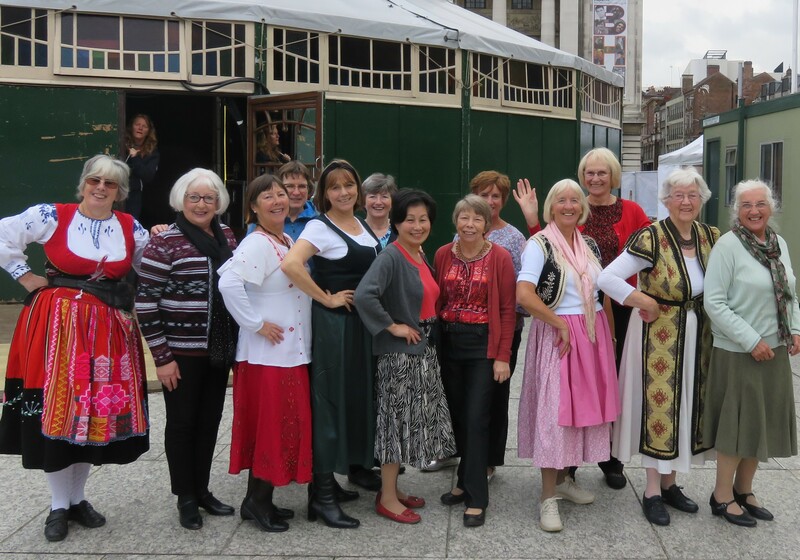 A memorable occasion was our performance on October 1st in the Spiegel tent in the market square. 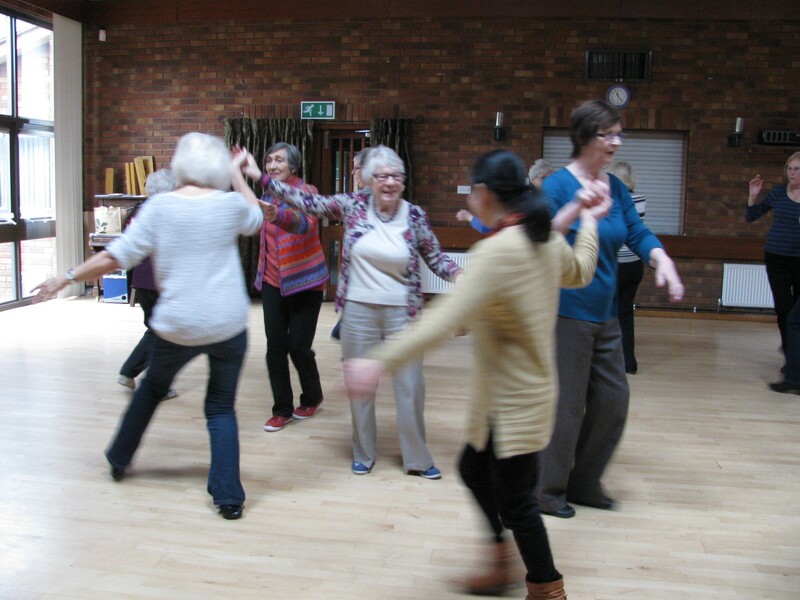 The SALI dancers joined with a few members of Nutbrook International Dance Group to show a mix of easy dances suitable for the older age group, as part of a dance festival for the over 50’s. We followed a group who displayed flamenco dances. Our group displayed a mix of circle dances which suited the circular tent and dance floor. We invited members of the audience to join us in our final dance and to our amazement they just got up with no break in the music joined in the group and the floor was full. It was great; such a wonderful happy atmosphere. We followed this Israeli dance with its rhythmic clapping and easy footwork with an old French dance to round off our allotted 15 minutes. 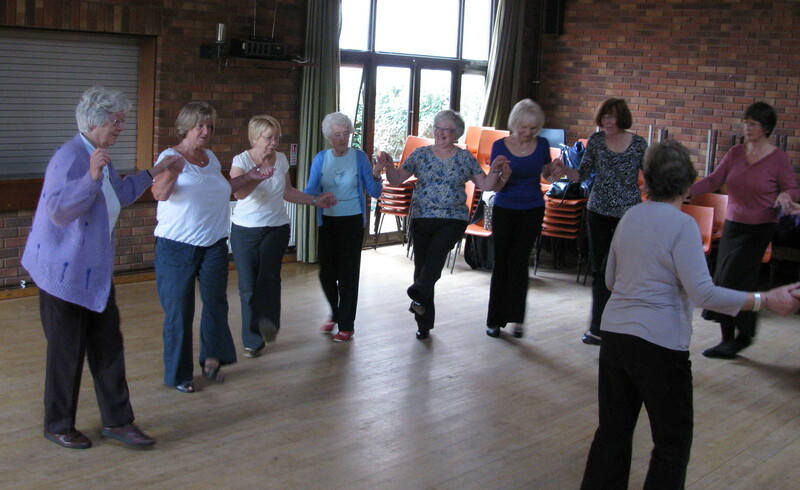 It was great to see so many people of all ages join in this “Age Friendly” afternoon of dance. 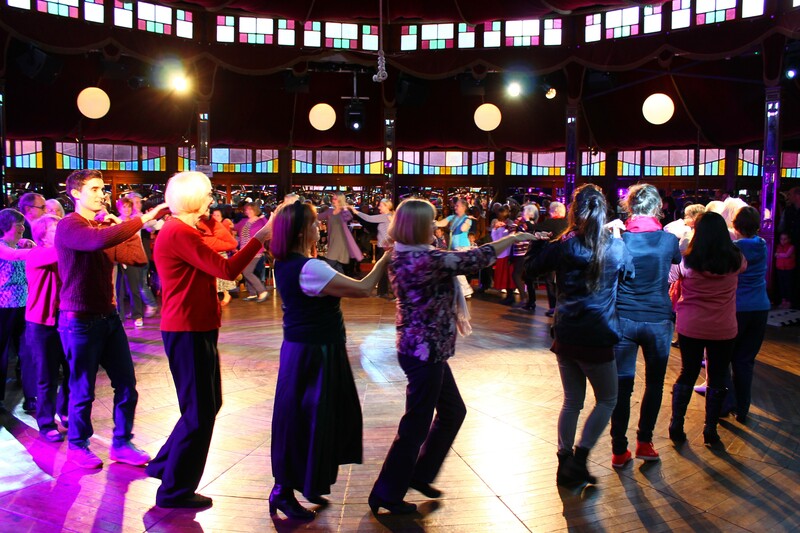 Your Folk Dance event in that wonderful theatre tent in Nottingham was such a success with so many of the audience joining in and obviously enjoying the experience. I just wished I could have joined in too. I would like to thank you and your dancers, on behalf of Councillor Campbell and myself, for giving your time to perform on Saturday – it was amazing. We had a great time at our last meeting enjoying dances from Bolivia, Taiwan, Israel, France, Bulgaria, Russia among others. We have enjoyed the music and movement, exercised our shoulders, our brains and our feet and had fun. We now have “time off” until September. We are happy to welcome new members to our Foster Avenue “home”. 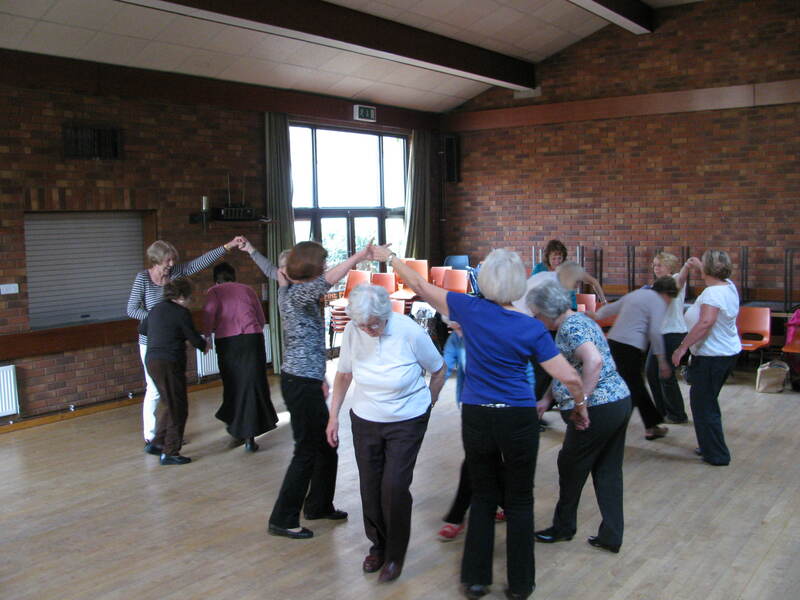 The group enjoys a variety of music and dances. This year (2016) we have learned a new dance from Romania with a lovely musical introduction on a zither, danced some old Israeli favourites and tried out a couple of dances from the Netherlands. Our repertoire includes countries from New Zealand to Estonia. Our most popular dances come from Israel, Bulgaria, Romania, France to name but a few. Our aim is simple – to have fun whilst learning. No-one makes mistakes although we may from time to time do variations. At the January meeting, we did enjoy a laugh at my “technical terms” and also at the cheese basket dance with hands forming the cheese basket. This dance comes from Estonia. Come and try us out – the more the merrier. From March 8th 2016 we will meet in the Church Hall off Foster Ave, behind the R.C. Church. Access by foot from Foster Ave, Access by car from Cavendish close via Devonshire Ave. We will have to charge £2.50 to cover the cost of this hall with no stairs. Dancing continues merrily on the 2nd and 4th Tuesday mornings above the Fabric shop in Chilwell. We will meet there until at least March 2016 when we hope all the refurbishments at Foster Ave catholic church hall will be completed. Our new venue is spacious and pleasant but the stairs are steep. During the last term we have tried some Bulgarian and Albanian dances mixed in with our Israeli favourites and a few from countries as far apart as Puerto Rico and the Netherlands. We welcome new members as no partners are needed and we all learn together. From September until Christmas the SALI dancers (international Folk dance) will be meeting above The Fabric Shop, Chilwell High Road. We will still meet the 2nd and 4th Tuesdays 10.00 – 1200. Please bring a change a shoes and be aware that some of the stairs are steep. Access is from the little side road through the archway to the back door of The Fabric Shop. Inquiries to gill.morral@ntlworld or Linda Selby. 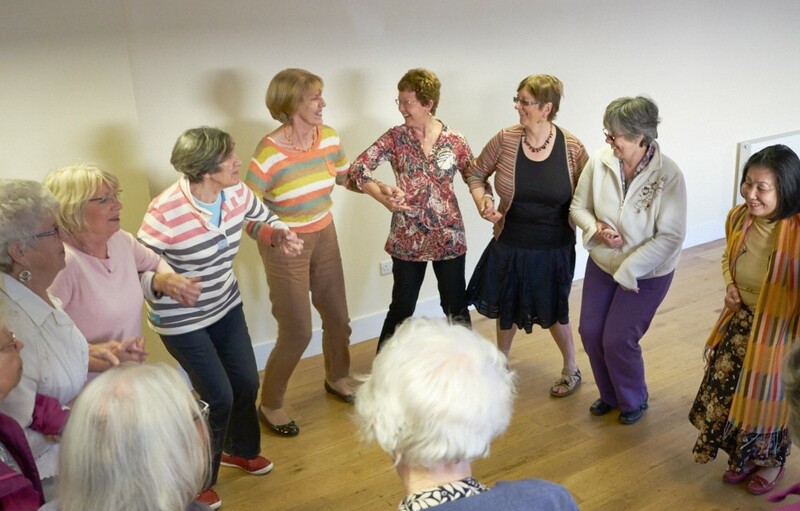 Martin Wilson, who is producing a Third Age Photography Project, attended the International Dance class recently and he writes of his experience and photographed the group “doing their thing” It certainly looks like a good time was being had by all ! Martin wrote this piece for the Newsletter. I was made very welcome by the Folk dancing Group when I went to try and get some photographs for my Third Age photography project. The sixteen members who were there enthusiastically worked through dances from around the world; Russian, Jewish, Estonian and more. As one member told me “it is all about the music, we love the music and would come for that alone”. However they threw themselves into the dancing with a lot of lively banter and laughter. 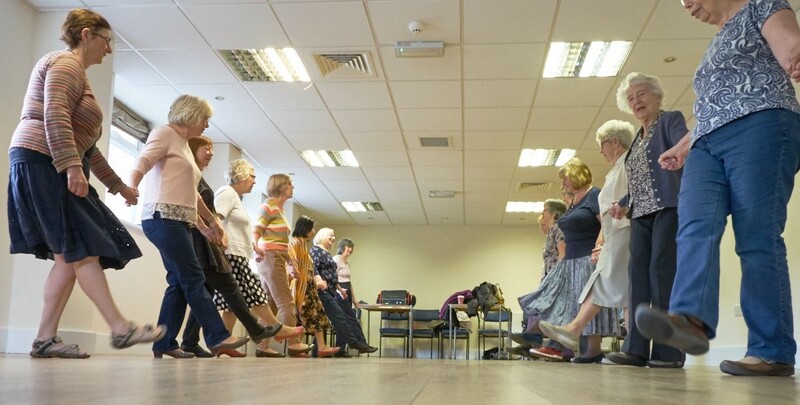 The group was led by Gill Morral who clearly had wide knowledge of folk dance, not only musically but the technical aspects of the dances, for example stressing the need to have one’s weight on the correct foot especially during the transitions and changes of direction. I was learning fast even though I was not a dancer, I have two left feet so declined to join in but I am sure my clumsiness would have been excused if I had. Every 2nd and 4th Tuesday morning we are still enjoying ourselves. Dancing, chat and giggles are the order of the day. The dances are very mixed in style and format, as the programme for January 27th shows. We began with an old favourite Neda Grivna-(Romania_necklace of beads) before moving on to Zemer Atik (Israel) then a partner waltzy dance from Swizterland – Apenzeller Klatcshenwaltzer. This is a clapping dance with waltz from the Appenzell valley. We moved on to a dance from Estonia – Oige Ya Vasemba – meaning right and left so now we know some Estonian language as well! Nipping across the border we enjoyed Walenki with waves and arches before having a well-earned break. After our break we learnt another new dance which came this time from Japan. The title – Tajimi Ko Uta. This is a dance good for coordination and has many terms useful for remembering the arm movements of the dance. Such terms Fuji (hands in a volcano triangular shape) take your sweater off – (arms cross then lifts before descending as one glides along). The last movement brought much merriment as we tried to make our right hand do something very different to our left hand. We finished the morning with 3 more dances, one Russian and 2 from Israel. There is space for more fun loving folk. The Summer term has been a good one for us. We have learnt dances from more new countries, including a lovely scarf dance from Russia, a dance from Belgium and a gentle story dance from the Pacific. We will begin the Autumn term on September at our new venue – Conservative Club on Station road – chosen because of its central position, car park and ease of access. We will be dancing in the ground floor room. It is a long thin room so we hope to move back to the church hall on Foster Avenue when it is refurbished, hopefully early in 2015. Our numbers have increased slightly with a couple of new comers and some “returners”. We have enjoyed some new dancers and struggled with the unfamiliar rhythm of a Macedonian dance. We had a minor hiccup one week when the tape recorder “died”. We danced to an Israeli tune that we could sing before being rescued by Norah who went home for her tape recorder. We went on to learn an English folk dance “Gathering Peascods.” Our repertoire is constantly expanding. SALI dancers continue to meet on the second and 4th Tuesday morning. An exception will be April because of Easter. Future dates are as follows. We decided this week to adopt a name – SALI folk. Smile And Learn International along with various other possibilities but whatever the words you will fit to the initials we will still sally forth every 2nd and 4th Tuesday in January 2014. We look forward to lots of new members who wish to exercise off their Christmas feasting. Our dates for 2014 are January 2014 -14th and 28th February 18th and 25th March 11th and 25th. Please come and join us. The group has extended its repertoire with dances from Tibet and Taiwan. For the latter dance, bells on the wrist give a new dimension to our dancing. The dance is easy and fun. We continue with lots of dances in circles without partners from such countries as Bulgaria, Croatia, Albania, Romania, Greece and Israel. We have learnt another Portuguese partner dance which is danced in small circles which replicate the shape of a barrel and was danced when pressing grapes in such a barrel. Dancing continues to be fun, lots of laughter and variety. Do come and join us. The forthcoming dates are May 28th June 11th and 25th July 9th and 23rd and September 10th. There will be no meeting in August. December 2012, 11th – party. January 2013, 8th and 22nd. February 2013, 19th and 26th. March 2013, 12th and 26th. Dances from all over the world, continue to be enjoyed. New countries in the last three months have been England and Japan. It is not all new every week. Repeats and recaps help to ease the concentration which is needed. Indeed some dances such as Ma Navu, Zemer Atik (Israel) and Lenocheck (flax – Russia) are just three dances into which the group drift happily along. Some dances are partner dances, some with patterns and some need concentration. Oige Ya Vasemba meaning right and left is a walking dance, initially in a circle to the left, then in 2 circles going opposite ways, and then linked up circles and finally a chain. A great sense of achievement can be gained from success in any arena, including International dance. To end July and set the Olympics off with a swing, Tuesday 24th July featured dances from Olympic host countries and participants. It began in Greece- Levantinikos (1896 1st Games, 14 countries, 241 athletes in 43 events opened by King George 1st) and was followed by Maitre de la Maison – France 1900 (World fair so lasted 5 months, croquet had only 1 spectator, some teams like tennis were mixed). U.S.A. – dance Arkansas Traveller – came next (651 athletes, 645 men and 6 women representing 12 countries as the others could not get to St Louis). The session followed in this pattern with a dance and some facts about the Games. We included an Israeli dance to celebrate their participation in 1952 and had a good laugh with our attempt at “Fujiama” a nickname for a Japanese dance with a wide variety of movements – jumper off – rice bowl – pendulum. These are clues as to the movements required. We still meet at 10.00 every 2nd or 4th Tuesdays and to cover the cost of the hall we charge £2 unless numbers are low then it will have to be £2.50. Question: Do you need a partner? Answer: No. Lots of the dances are non partner dances in circles and for the others that are partners we just partner up in twos. Some of these are progressive so you move on anyway. Question: Why do you like it? Answer: Shirley “I always look forward to coming- it is not serious and is very enjoyable.” Evelyn “It makes me smile and is therefore an enjoyable way to spend 2 hours. Member “I like the variety of step and rhythm. I like the music especially the lyrical music of Greece or the moody music of Russia. Question: What kind of step and rhythms are there? Answer: The Yemenite step is a common one in Israeli dances -a 3 syllable word a 3 part step- but it is easy especially after one has done it a few times. It is like anything else it is strange at first and may seem hard but practice makes it easy. Many of the dances have walking steps. The best way to see what we do is come, look and try. The group is thriving and now has 30 members on our list, with an average varying around 18 at the sessions every 2nd and 4th week. We all enjoyed our Christmas session, as not only were there 2 teachers but we had an extra half hour to enjoy party food. Since returning in the New Year we have begun learning the rhythms ofGreece and thoroughly enjoyed a Maori dance fromNew Zealand. We also enjoyed the story of Cocoa- Koko Samoa – a dance from theisland ofSamoa. I would like to thank everyone who has supported me in those little jobs at the beginning and end of session, collecting money, putting away chairs, closing curtains etc, and look forward to the next few months of Dance. The group is thriving and enjoying a variety of styles, rhythms and steps from many countries. It meets at the Church Hall behind the Roman Catholic Church on Foster Avenue where there is ample parking and easy access from Beeston town centre. The hall is very good and so far (touch wood) there have been no problems. £2 is collected, per dancer per visit, to cover the cost of the hall and this will enable us to have a free week during December. The countries which we have explored so far are Mexico, France, Israel, Hungary, Russia, Bulgaria, Greece, and Romania. The numbers attending vary between 12 and 20. Usually there are now on average 18 people attending each time on the second and fourth Tuesday morning between 10.00 am and 12 noon. The dances photographed were Greek and Russian although on the same morning we also danced csangos from Hungary and Moldavia. We also enjoyed Romanian dance which actually originated in Moldova. Atlas will be supplied next time! We all have a good time with laughter, a good sign, as there are no incorrect moves – just variations. We dance many Circle dances, and open circle dances in which no partners are needed. We have enjoyed a women’s dance from Russia where couples of ladies revolve like gateposts and then do a step called prepedanya whilst the arms are in a shape called (by me, – not technical) “Rocking the baby” Another Russian dance begins in a circle but breaks into groups of 4 or 5 with arching and tunnelling figures before rejoining into a cycle again. Please note that April 10th is Easter Tuesday and that there is no meeting 2nd Tuesday in June. Times at 10.00 to 12 midday.